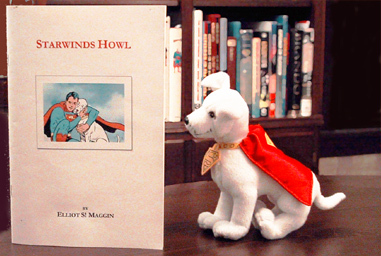 At more than 17,000 words, Starwinds Howl relates the epic story of Krypto the Superdog and the emotional struggles of the young Kal-El. "dog stories are great, especially when you take the dogs seriously. Why has Krypto as a character survived in all our imaginations for all these years? It's because -- like White Fang -- Krypto fulfills a need in many of our individually rich fantasy theaters. The story of his bonding with the baby Kal-El, his being lost in space, his adventures and will to survive even after he is lost and his homeworld is destroyed, his spectacular reunion as a grown dog with the boy Clark Kent ... this is the stuff of legend." The story was first made available online at this website on July 26, 1999, and later in a limited-edition small-press fanzine, now out of print. "Starwinds Howl is an incredible story filled with all the wonder of the Silver Age of comics. I now believe a dog can fly." "I didn't realize just how much I mised Krypto until I read this tale -- it made me cry with joy and with happy memories." "This is the best Krypto story I've ever read. A worthy addition to the Maggin Canon." Shortly thereafter DC introduced a Krypto soft-toy and later re-introduced the unstoppable pet to the comic books.